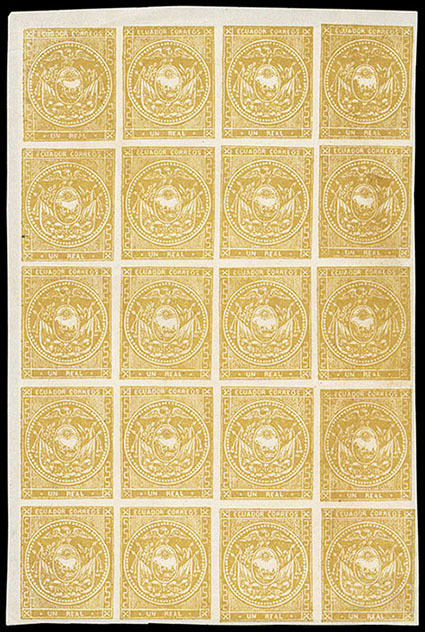 Ecuador, 1865, 1r Olive Yellow, upper left corner margin block of 20 (positions 1-4 / 10-13 / 19-22 / 28-31 / 37-40), position 4 showing double frameline at bottom, without gum, full margins, rich deep color, diagonal crease at top left affecting position 1, otherwise Very Fine, a rare multiple in this shade, ex-Goeggel. 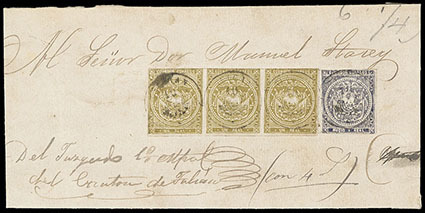 Ecuador, 1865, 1r Olive, group of three multiples; includes unused horizontal pair, used horizontal pair in bistre olive with 1870 Guayaquil town cancel, and horizontal strip of three on part Judicial front in combination with ½r blue gray canceled by Tulcan town cancels, Very Fine. Scott No. 3 Estimate $300 - 400.